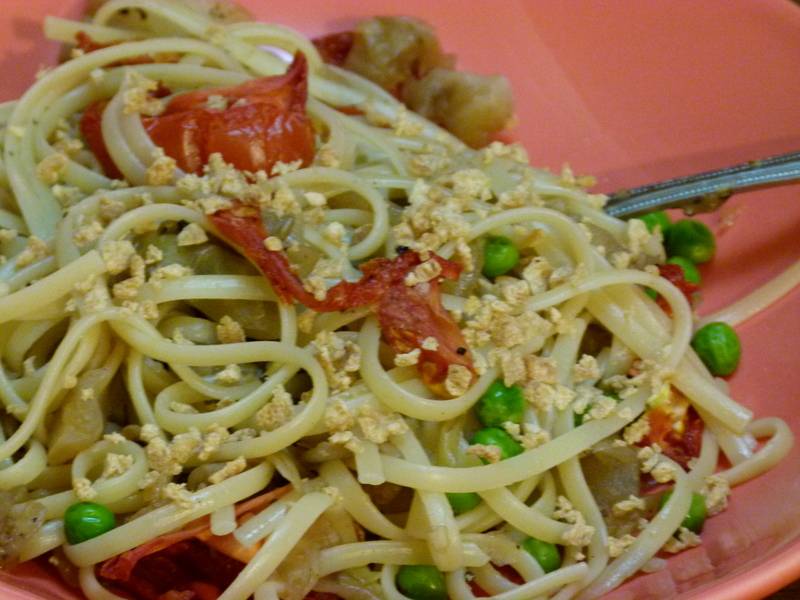 Delicious vegan no-fat main dishes! Good news: my long-suffering oven has finally gone to meet it’s maker. Bad news: it is Sunday night and although I have a luscious long list of recipes to test bake, my oven is kaput. I’m going to Plan B, which is to use the Ras el Hanout spice I was gifted recently to build an exotic batch of stove-top Moroccan couscous. The spice is widely available in the U.S., but it differs greatly in composition from brand to brand. Mine has warm, fruity scent, almost like the spiced winter holiday pudding I love so much. Wherever you find yours, be sure to sniff to make sure it tempts you, and acquire only small amounts, freshly ground. This recipe is savory, with sweet dried fruit, but pulls its bright flavor from fresh lemon juice and orange zest. It is finished with crisp toasted walnuts, scallions and chopped cilantro, for a fresh-out-of-the garden texture. Oh my! 1. Put chopped fruits in a small bowl and marinate in lemon juice for 1 or 2 hours. 2. In a saucepan, bring the couscous, water or vegetable broth, Ras el Hanout spice, garbanzo beans and chopped onion up to a boil. Cover and simmer on low until the liquid is absorbed, or 20 to 30 minutes. Remove lid and cool for 10 minutes. 3. Mix together the fruit with its marinade, couscous, & green onion. 4. 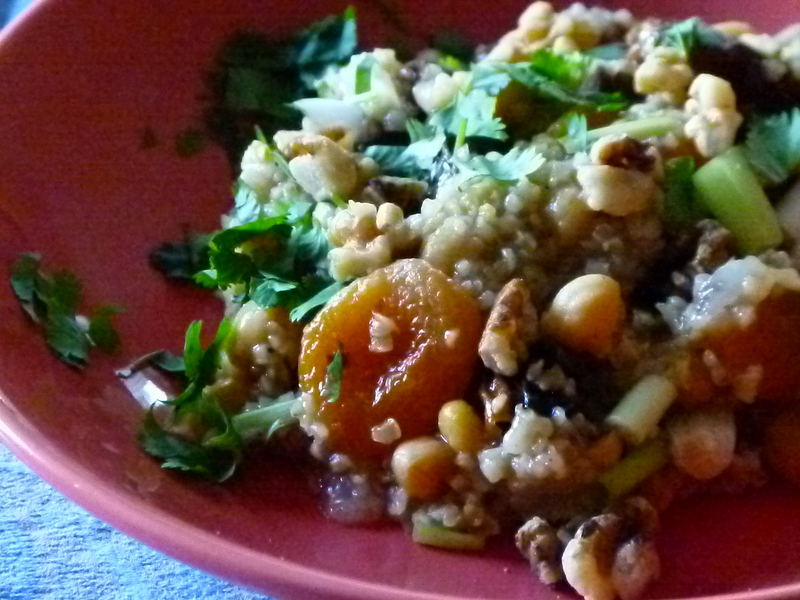 Place the Ras el Hanout couscous in a favorite serving bowl and finish by squeezing the juice of 1/2 orange over all. Garnish with walnuts, cilantro and orange zest. When I made the switch to no-fat vegan eating, I grieved for my long-favorite cookbooks filled with the foods that had given me and my family such tasty memories over the years. After just a few weeks, I began to adapt those recipe treasures, and I am happy to say that with the right tools and a little creativity, many if not most things are possible! 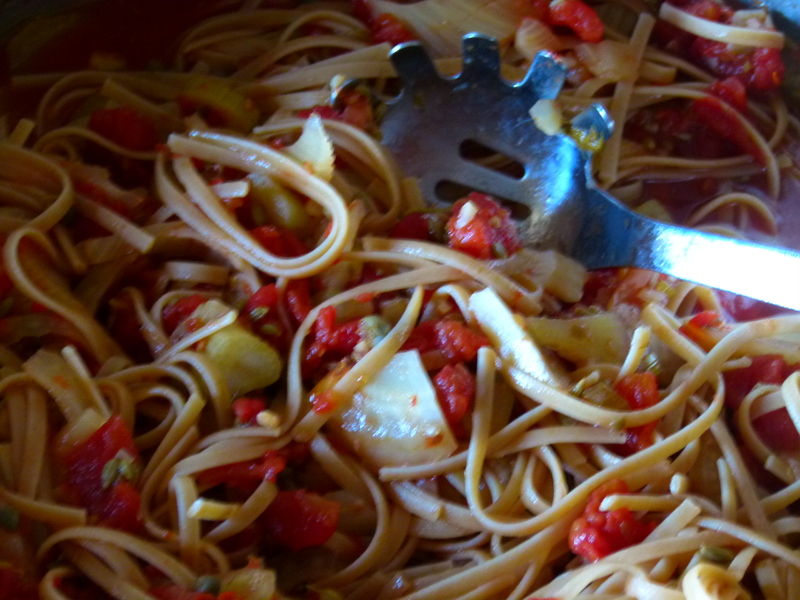 Here is an adapted version of a delicious recipe from Lynne Rossetto Kasper out of my all-time favorite Italian cookbook “The Italian Country Table”. 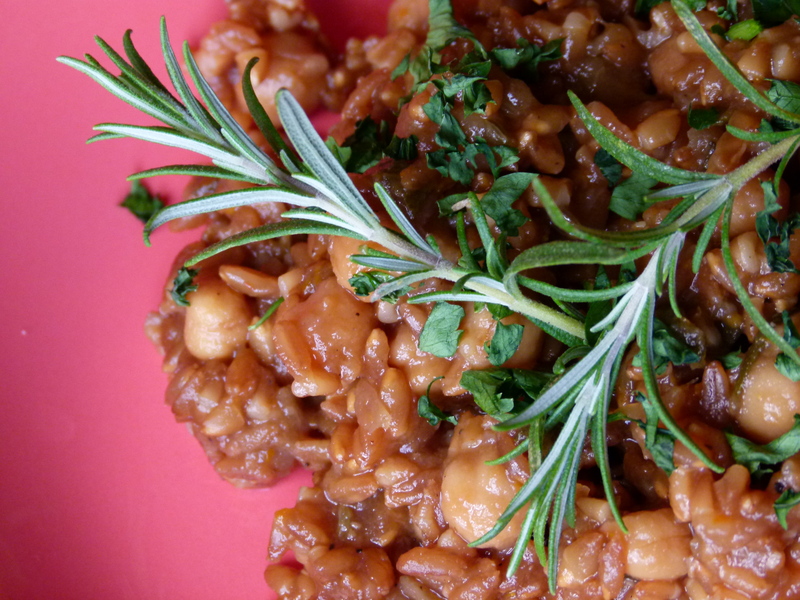 Farro is one of many super satisfying, nutty whole grains I’ve come to love. Cook this for a full hour and the flavors of orange, sage, garlic and fennel and wine will carmelize into heavenly sweetness. Put dry farro in a 3 cup bowl and cover with very hot water for 15 minutes. “Saute” onion, sage, rosemary and fennel by placing in a large pot or deep saucepan, tossing with 1 or 2 cups broth, and covering with a lid. Simmer until the onion is softened, about 5 minutes. Remove lid. Add the garbanzo beans w/liquid, garlic, farro, and 1/2 the orange zest. Cook on medium until liquid evaporates and begin adding hot broth 1 cup at a time, cooking and stirring until liquid evaporates and your hot broth is gone. The cooking time will take about 50 minutes. Don’t hurry, the carmelization process is so important to the result, and besides, you can drink a glass of wine while you cook! Test to make sure the farro is cooked to your liking. It will have a uniform, chewy texture similar to cooked barley. When all the liquid is absorbed and the farro is done, stir in the remaining orange zest and white wine. Season to your taste with salt substitute or salt & freshly ground pepper. Simmer another few minutes until creamy and rich. 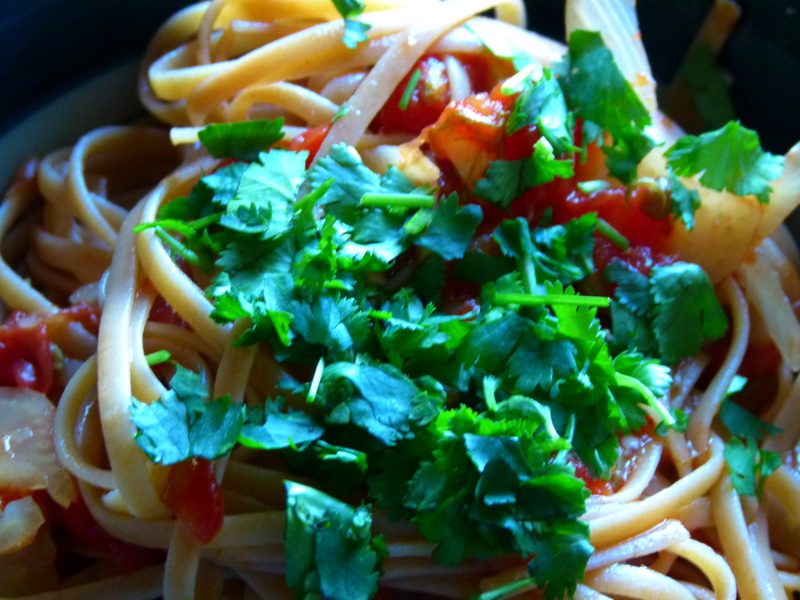 Serve with chopped parsley.